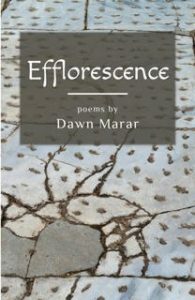 In Efflorescence, Dawn Marar navigates borders — between America and the Middle East, between family and political life, between art and nature — and even crosses a border of language, inserting Arabic words among the English lines. 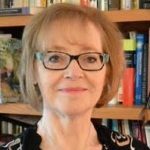 She is an adventurous writer — both playful and complex — who views the world through the lens of conscience. These elements blend together to create a moving, cohesive poetry collection full of intelligence and attention to detail. pointed like Brancusi’s Sleeping Muse. Efflorescence means a peak flowering and may apply to either a plant or a civilization. The epigraph, from a quote by Leader Scott, points to what happens next: “And after efflorescence,—decay; the old organization, by degrees, dissolved in the greater freedom of art.” In the eponymous poem the speaker leaps from “[p]eaking star magnolia tepals” (22) in her yard to “scraps of bandages calling up wounds” (22) to her feelings about the Iraqi war: “Her face burns as Bush declares war upon the world” (23).